Cooking your own food from familiar ingredients means you can feel more confident about eating and meeting your nutritional needs. It also makes eating with other people relaxing as you know what is in the food. Some popular Italian dishes always go down well if you are cooking for others but they may need to be adapted a little if you have a sensitive gut. So how do you go about adapting a recipe? Caponata is a fragrant, slow cooked Sicilian vegetable stew with savoury, sweet and sour elements. The ingredients are classic flavour and colour combinations that work well together such as basil and tomatoes, and olives and aubergine. Look through the list of ingredients in any recipe to check for any that might upset you and if you spot one use less of it or leave it out all together. With a little adjustment you can usually compensate for the missing ingredient, especially in a recipe like this where there are so many flavours making the dish taste good. Traditionally caponata contains an onion and garlic. The recipe works well without the onion if you use garlic infused oil or the green leaves of young leeks or spring onions. The long slow cooking ensures the flavours of this dish are well developed and taste good. When onion and garlic are cooked for a long time with other ingredients their flavour disappears into the background anyway. The other thing to note in this recipe is that most people should be able to tolerate half a medium sized aubergine without triggering symptoms but more may be a problem for some. So go easy at first with aubergine. Cooking helps you to build experience of what you can eat and the portion size that suits you. This is why it is important to experiment with cooking so you build the confidence to know what works and what does not. Having practical wisdom as a cook is so important and then you have the confidence to make adjustments to recipes as you need to knowing they will turn out well. 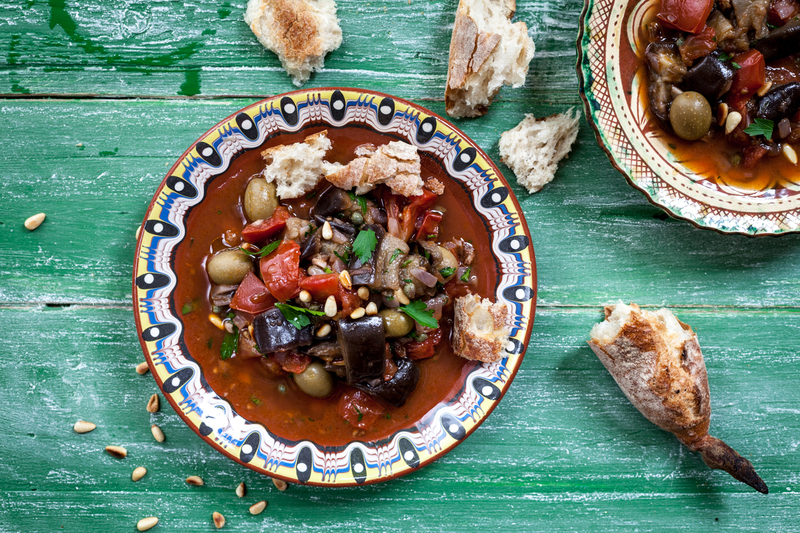 So good luck with this delicious caponata recipe which has been adapated from one by the marvellous Italian chef Antonio Carluccio. Adapting other types of recipes, for example cakes, is more complicated because the ratio of one ingredient to another is crucial to the structure but in stews it is a simpler. We will talk about adapting baking recipes to suit you another day. Sprinkle aubergines with cooking salt and leave for 10 minutes until beads of moisture collect on the cut surfaces of the aubergine. Rinse the aubergine in cold water. This is to soften the texture of the aubergine and is a step you should not miss out. Dribble the olive oil into a large frying pan or saucepan with a lid and cook the garlic slices until browned. Remove the garlic from the oil and discard. Toss the aubergine in the oil so it is well coated . Place a lid on the pan and place on top of a gentle heat to cook until the aubergine is soft. This will take about 15 – 20 minutes. Add the chopped tomato, tomato puree, bay leaves, a splash of vinegar and sugar to the aubergine and mix well. Finally add the capers, olives and raisins, if using. Replace the lid of the pan and continue to cook until the aubergine are soft and the tomatoes have collapsed. Covering the pan with a lid prevent the sauce from drying out. if it does just add a little water. Season to taste before serving the caponata with pine kernels and a few torn basil leaves or a little chopped parsley. Serve this dish on its own with gluten free pasta, noodles, sour dough spelt bread or risotto. It also makes a great side dish for meat such as chicken or beef and fish. 13 Aug	This entry was written by Joan Ransley and published on August 13, 2015 at 3:11 pm. It’s filed under Dinner, Lunch, Side dish, Snack, Starter and tagged aubergine, Caponata, healthy eating, IBS, IBS Network, Italian, LowFodMap, sicilian stew. Bookmark the permalink. Follow any comments here with the RSS feed for this post.